For more than 50 years, every time Buick has released a performance-oriented model, it’s been greeted with puzzlement, not unlike the public response to then-presidential candidate Bill Clinton playing the saxophone on a late-night talk show in 1992. In a way, that’s odd because Buick has built some of the hottest passenger cars to emerge from any GM division. 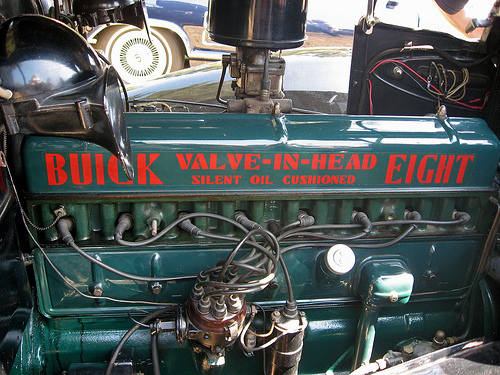 Buick was an early advocate of free-breathing overhead-valve engines (an arrangement now universal for modern passenger cars) and even set a number of speed records before World War I. As we’ve previously seen, the 1936-1942 Buick Century was one of the fastest American production cars of its day, becoming very popular with hot rodders. The OHV straight eight of Buick’s 1937 Special. It was 248 cu. in. (4,065 cc) and rated at 100 hp (75 kW). Such feats of speed were not, however, a major part of Buick’s brand image, which focused on a cloud-like ride and posh, Cadillac-like interior appointments. 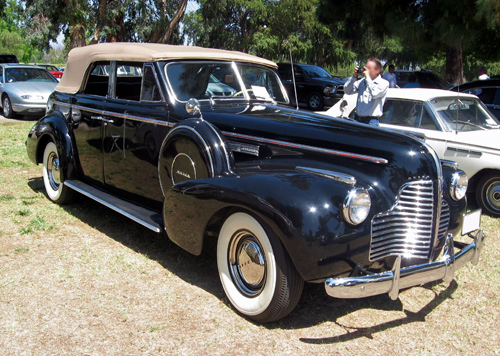 Shortly before World War II, Buick general manager Harlow Curtice even developed a semi-custom Limited model with bodywork by the coachbuilder Brunn, although complaints from Cadillac made it short-lived. The advent of the smooth but slushy Dynaflow automatic in 1948 only cemented Buick’s image as a prestigious but rather staid land yacht, the prototypical doctor’s car. While Cadillac and Oldsmobile led the switch from flathead engines to OHV V8s in the late forties, Buick was in no great hurry to follow suit, since the division’s big OHV straight eight still equaled the output of the early postwar V8s. Also, a 90-degree V8 would be shorter and lower than a straight eight, but also wider, which presented packaging problems for Buick’s existing cars, designed around inline engines; for that reason, the V8 concepts with which Buick engineers experimented in the late forties had narrow (22- and 35-degree) bank angles. Buick didn’t start production work on a 90-degree V8 until 1950, by which time the division was looking ahead to a newer generation of cars with lower, flatter hood lines. The 1940 Buick Century had the 320 cu. in. (5,247 cc) straight eight of the Roadmaster and Limited, boasting 141 gross horsepower (105 kW). In 1941, it added Compound Carburetion, giving it 165 gross horsepower (123 kW) — the most powerful American production car of its day. The lighter Centuries could reach 60 mph (97 km/h) in around 12 seconds and a top speed of perhaps 103 mph (165 km/h). At the time, production cars that could crack the 100-mph mark were not common, especially in the middle-class price brackets. Despite that slow start, Buick’s 322 cu. in. (5,272 cc) V8, which debuted for the 1953 model year, was among the hottest of the new crop of engines. Developed by Joseph Turlay and Verner Matthews, it had a then-unusual pentroof combustion chamber design, which offered the thermal efficiency and short flame travel of a hemispherical combustion chamber with less bulk and weight. Although its valve area was relatively small, the V8 was a free-revving engine, capable of 6,000 rpm in proper tune. The “Nailhead,” as it soon became known due to its nearly vertical valve stems and relatively small valves, was also quite compact and it was one of the lightest V8s of its time: about 65 lb (29 kg) lighter than Cadillac’s V8 and about 110 lb (50 kg) lighter than the Chrysler FirePower, both of which had similar displacement. In production form, Buick tuned the V8 more for torque than outright horsepower, but there was considerable potential. Had it not been for the advent two years later of the Chevrolet V8, which offered even greater potential in a still-lighter, cheaper package, the Buick V8 might have become a favorite of the shade-tree tuner crowd. Even after the arrival of the Chevy small block, there was a brief vogue for the Nailhead among hot rodders like Max Balchowsky and Tony Nancy. Buick even took a brief stab at NASCAR, winning two races in 1955. Even in pure stock form, the new Buick V8 was formidable enough. By 1954, its second year, it was up to 200 hp (149 kW) and 302 lb-ft (408 N-m) of torque, among the most powerful passenger car engines in America. In 1954, Buick revived the old Century nameplate, marrying the engine from the big Roadmaster with the shorter, lighter chassis of the Special. The Century was hardly a small car, but it weighed more than 400 lb (190 kg) less than a Roadmaster, which made for muscular performance. The division didn’t go out of its way to promote the Century, or any Buick, as a performance model. Buick subscribed to an older and simpler philosophy: that luxury cars should naturally be able to outrun cheap ones. Even the entry-level Special had fine performance, although its handling was soggy and its brakes were inadequate. That was fine with buyers, who snapped up new Buicks at an unprecedented rate. 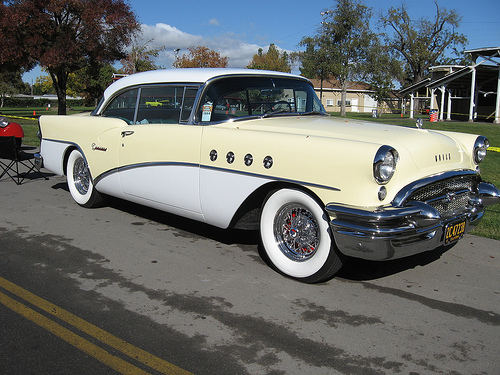 By 1955, Buick controlled nearly 10% of the American market, selling more than 700,000 cars. Buick’s remarkable success soon slipped a gear. Responding to the increased demand, general manager Ivan Wiles (reportedly with some instigation from Harlow Curtice, who had become president of General Motors in 1953) greatly stepped up production, which had a negative effect on quality control, traditionally a Buick strong point. 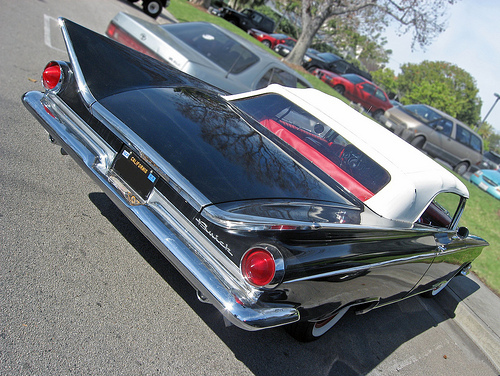 Customer word of mouth began to sour, exacerbated by unpopular styling for 1957. Around that time, the U.S. economy began a sharp dip, which combined with heavy-handed design and troublesome new options — the short-lived Air Poise air suspension and complex Flight-Pitch Dynaflow transmission — to turn the 1958 model year into a complete rout. Sales fell to around 240,000 units, less than a third of 1955’s peak. While 1959’s total sales were better — a bit under 285,000 — Buick’s market share slumped to less than 5%. Ed Ragsdale, who had replaced Ivan Wiles as Buick’s general manager in March 1956, ended up becoming something of a scapegoat for the whole mess. It was true that Ragsdale had been Buick’s general manufacturing manager since 1949 and the decline in assembly quality had occurred under his watch, but the order to increase production had come from Wiles and Curtice, who had also approved the 1957-1958 styling and the use of the triple-turbine transmission — an interesting idea that was probably not ready for mass production. By 1959, though, both were gone. Wiles had retired in December 1957, followed in August 1958 by Curtice, who was succeeded by former Cadillac general manager Jack Gordon. Ragsdale, now lacking management support, retired in 1959, several years ahead of GM’s normal retirement age of 65. The wild styling of GM’s 1959 cars was directly inspired by the 1957 Chryslers, which left GM designers in mortal fear of losing their styling leadership. Public reaction was mixed at best and many of these designs have become notorious as symbols of Detroit excess. 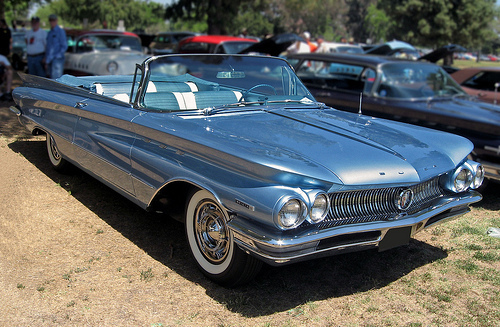 This is an Electra 225, which replaced the Limited as Buick’s top-of-the-line model in 1959. It’s 225.4 inches (5,725 mm) long on a 126.3-inch (3,208 mm) wheelbase, powered by a 401 cu. in. (6,567 cc) engine with 325 hp (242 kW). With air conditioning and other options, it weighs close to 4,800 lb (2,180 kg) at the curb. With Buick in such bad shape, its top job was not an attractive post. Candidates knew that if the division collapsed — a real possibility given the magnitude of its decline — it would reflect badly on them. At least one GM vice president allegedly rejected the position when it was offered to him. In late April 1959, GM announced Ragsdale’s replacement: Edward D. Rollert. Rollert, who’d been at GM since the early thirties, had spent the early fifties as the general manager of the joint Buick-Oldsmobile-Pontiac plant in Kansas City, Kansas (later the first GMAD plant), where he had supervised its conversion to military production; the Kansas City plant built both cars and the Republic F-84F Thunderstreak fighter. 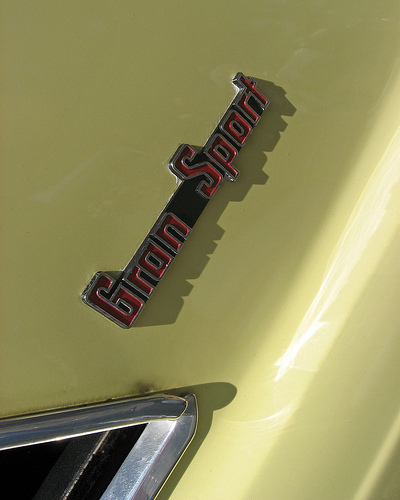 In 1955, GM transferred Rollert to run the Harrison Radiator Division in Lockport, New York, where he had cemented his reputation as an aggressive and demanding leader, one of GM’s rising stars. When Rollert arrived at Buick, the 1960 models were already done, and the 1961s were close to finished, but no one had much confidence that they would sell. The 1959 Buicks had had all-new styling, bigger engines, a much-improved chassis, a new ad strategy from a completely different ad agency, and even new model names, but it had been to little avail. Although the public wasn’t sure what to make of the Batmobile styling, the 1959 Buick offered some useful mechanical improvements, including better suspension geometry, a wider track, and a stiffer K-type frame. It also had much-improved brakes: big finned drums. As in 1958, the front drums were aluminum for better heat dissipation, although the inner surfaces were iron-aluminum alloy to reduce wear. Buick used these brakes for another decade, although front discs superseded them by the late sixties. Rollert wasted little time in filling Buick’s top slots with his own people, many of them fellow alumni of Purdue University, Rollert’s alma mater. In short order, he appointed Roland Withers as general sales manager, Bob Kessler as head of manufacturing, Gerald Rideout as PR director, and Oldsmobile’s Lowell Kintigh as chief engineer. There was immediate friction between the new arrivals and Buick’s long-time veterans, but Rollert was able to make significant strides in repairing Buick’s tarnished image for reliability, including giving quality control manager John Gretzinger new authority to address problems on the line. Despite the new blood, 1960 was Buick’s nadir. Sales had fallen to fewer than 254,000 with no signs of improvement and market share didn’t even reach 4% — only half of AMC’s share. 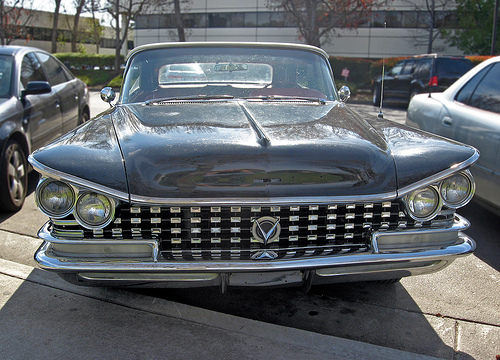 Buick’s 1960 models were not bad cars, but the division desperately needed a new direction. The 1960 Buick line differed only slightly from the 1959, although the Triple Turbine and air suspension options were both discontinued and the convex grille of the ’59 was replaced by a concave unit. This was the last year for Buick’s torque-tube rear suspension, which the division had used since 1938. It was replaced in 1961 by an open driveshaft and live axle, located by control arms. The Invicta was one of the smaller Buicks: 218 inches (5,537 mm) on a 123-inch (3,124-mm) wheelbase, weighing around 4,500 lb (2,040 kg).